We disembark the ship at 7:00 AM gathered our luggage and boarded the bus for downtown Athens. Everyone had 3 to 4 hours of free time to enjoy the restaurants and shops and ambience of this ancient city. We boarded our plane and headed on the short flight to Thessaloniki after which we boarded our bus and did a tour of this biblical area in northern Greece. We had Mass at the Thessaloniki Cathedral of the Immaculate Conception. You can hear/see Fr. Cole‘s homily here. After a good dinner at the hotel will be nestled in for the night ready to visit Philippi tomorrow morning. Enjoy! Were the Bereans “Bible Alone”? Since we are in Thessaloniki today, just a few miles from Berea (which I have visited a number of times), I thought I’d share my argument which turns the PROTEST-ant idea of “Sola Scriptura” on its head. You know, many Protestants appeal to the Bereans as proof of their false doctrine. Regarding the Bereans, it just ain’t so. 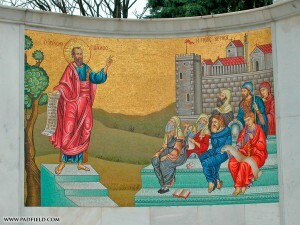 St. Paul traveled through Thessaloniki and Berea in modern-day Greece (Macedonia). The account is recorded in Acts 17:1-15. Many Protestants consider the Bereans as proto-Protestants holding to a “Bible alone” theology. But they are sadly mistaken. Here is my article “Why the Bereans Rejected Sola Scriptura” which was published in THIS ROCK Magazine a while ago. When you read this article you will discover that the Bereans were actually Catholic in their view of Scripture, tradition and authority.